60 minutes. Headphones not required. Eyes closed. Not suitable for looping. Includes full usage guide. This session will help you nod off gently and enjoy the deepest, most refreshing sleep you’ve had in years. And what does that mean? It means you’ll wake up feeling rejuvenated, full of energy, and ready for whatever the day ahead throws at you. 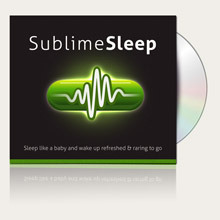 SublimeSleep promotes sleep induction, gently descending from 12Hz awake to 1.2Hz asleep. Start listening as you settle down for the night. The first twenty minutes will guide you through the dreamy steps to the land of Nod. You won’t often hear the end of this track!